The Litani river flooded many of the fields stretching across the two majestic mountain ranges flanking the Bekaa after this year's second major storm hit on Wednesday reports Arab News. 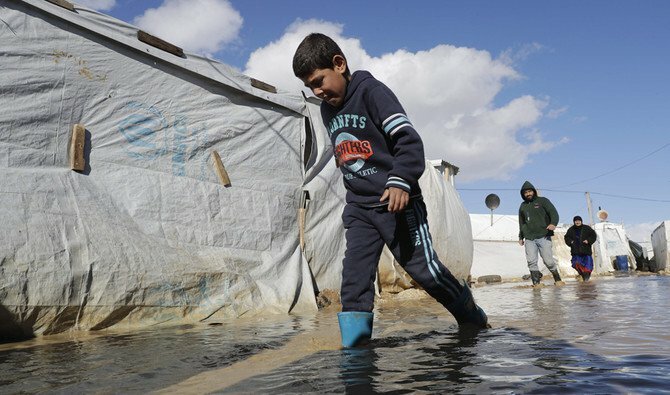 Snowstorms and weeks of bad weather have turned Lebanon’s lush Bekaa Valley into an unliveable swamp for tens of thousands of Syrian refugees. The Litani river flooded many of the fields stretching across the two majestic mountain ranges flanking the Bekaa after this year’s second major storm hit on Wednesday. “We spent all night emptying the tent but the water kept coming in,” said Thaer Ibrahim Mohammed, a red and white headscarf wrapped around his head. “This is the worst winter,” said the greying man. Gaggles of children made the most of the afternoon sun and pulled rubber boots on their bare feet to romp in the camp’s sludgy alleys and have snowball fights. The shelters in “Camp 040”, which lies on the edge of the village of Delhamiyeh and is one of the many informal settlements that dot the valley, are all the same. Thousands of refugees in informal settlements across Lebanon are at risk of extreme weather as Storm Miriam hit the country. UNHCR and partners continue to work tirelessly to assist affected refugees. “This year there was a lot of rain. But humanitarian organisations have reduced aid,” he said, standing on a brick placed as a stepping stone in a muddy puddle. “You just need to look: do you think this sheeting keeps us warm or keeps the water out? They gave us nothing, no new tarps, no firewood, nothing,” the young man said.